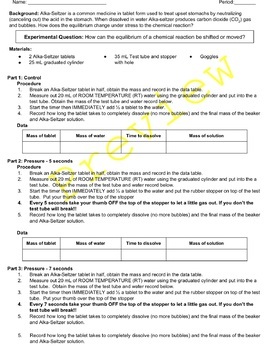 Low cost easy lab to demonstrate the effect of pressure on chemical equilibrium, one of Le Chatelier's principles. Students dissolve Alka Seltzer in test tubes, put a stopper with a hole on top and cover the hole and notice how the reaction changes when the pressure increases and when it decreases. Includes 5 student pages and 2 pages of teacher instructions and answer key. Student pages include data tables, modeling, research, presentations of models, refining models, CER (claim, evidence, reasoning), graphing and questions on lab. 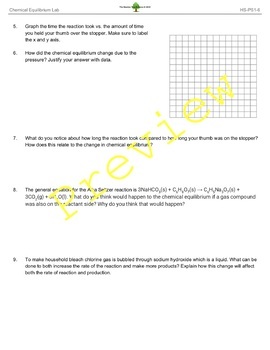 Lesson takes about 2 days (55 min periods) to complete lab, modeling, and questions. 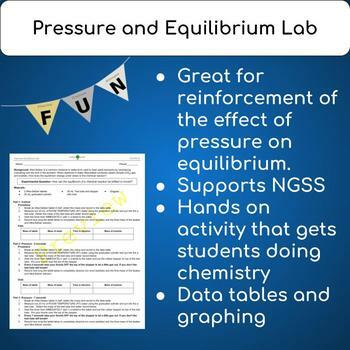 Supports *NGSS standard HS-PS1-6 Refine the design of a chemical system by specifying a change in conditions that would produce increased amounts of products at equilibrium.